TMS, a fast-growing fintech company, is proud to announce that its industry-leading subservicing platform SIME (Servicing Intelligence Made Easy) won Bronze in the Best in Biz Awards 2018 for the Most Innovative Product of the Year with the latest introduction of its mobile app. 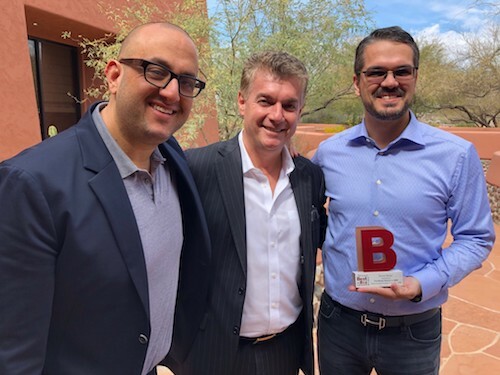 This marks the second year that Best in Biz has recognized SIME for its bold new approach to servicing. TMS disrupted the industry in early 2017 with the introduction of SIME by delivering a technology solution that provides on-demand customer data, real-time tracking of all borrower interactions and performance, end-to-end compliance, loan level detail and daily reporting to help reduce delinquent loans, and proactively service customers. In Spring 2018, TMS took SIME to the next level with the launch of TMS Happinest Mobile, a first-of-its-kind borrower facing app that puts the control in the customers hands, with the ability to upload and download documents, select preferred lines of communication and more. The Best in Biz Awards is the only independent business awards program judged each year by prominent editors and reporters from top-tier publications in North America, with entrants spanning the spectrum, from some of the most recognizable global brands to the most innovative local start-ups. Last year, SIME won Gold in the Best in Biz awards 2017 for Enterprise Product of the Year.